Sean Spicer is out, and Melissa McCarthy's fans are worried this signals the end of her "Saturday Night Live" take on the former White House press secretary. McCarthy's Spicer impression became a "Saturday Night Live" highlight after she debuted it in February. 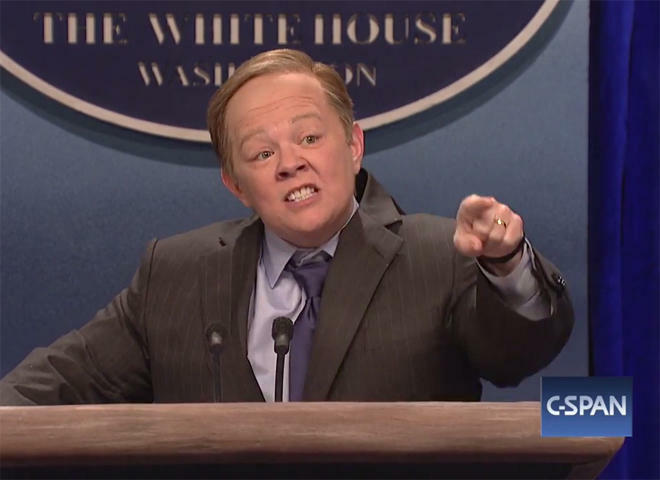 Her portrayal of a very belligerent "Spicey" was such a hit that she reprised the role several times on "SNL." Melissa McCarthy's Sean Spicer emerges from the bushes on "Saturday Night Live"
To impersonate the former press secretary, McCarthy donned a wig and suit and almost always stood behind a White House podium -- even when her character zoomed through the streets of New York. McCarthy also chewed lots of gum to play Spicer, who once told the Washington Post he chews and swallows as many as two and a half packs of Orbit cinnamon gum before noon. Fans on Twitter bemoaned the likely loss of McCarthy's impersonation on "SNL." Arsenio Hall was hopeful that McCarthy's impersonation would come back in some form. Others said they were sad for McCarthy, who migiht now be out of a job. BREAKING: Sean Spicer out. Melissa McCarthy devastated. I don't carea bout Sean Spicer at all, but I am very concerned about Melissa McCarthy. I will miss Melissa McCarthy as Sean Spicer. That's about it. Among McCarthy's most popular Spicer-themed skits was when McCarthy's Spicer hid in the bushes and traveled to New York City, podium in tow, to confront President Donald Trump, played by Alec Baldwin. Mr. Trump then grabbed Spicer and said, "Sean, kiss me," and when Spicer tried to resist, Mr. Trump said, "No, I'm famous, it's OK."
Spicer himself did not seem to mind the impersonation. He told "Extra" that he initially thought there was a national emergency because he got so many texts after the first "SNL" skit. Spicer said he found McCarthy's belligerent character funny, though he did say that McCarthy could "dial it back." Melissa McCarthy plays Sean Spicer on "Saturday Night Live"